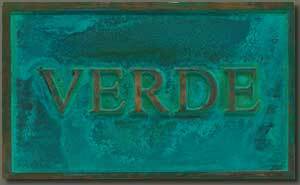 Memorial Plaques, Custom plaques by Bronze Memorials only sells the highest quality products, customized bronze plaques and full color custom photo plaques . Trusted Company still helping people with compassion and love after 37 years, and over 40,000+ customers. These consist of flat borders and are available at no extra cost on all standard sizes. Some designs are not practical on small namestrips under 3" in height. Unless otherwise noted all borders are standard and included in quoted prices. MOST POPULAR - Included in plaque price - No additional cost. 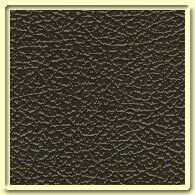 Economy Flat Decorative Borders - Add elegance and beauty. Borders are raised the same height as the plaque lettering and are highlighted to match the raised copy. ADDITIONAL CHARGE $5.00 per inch - Per running inch. Most of our borders - particularly the ornamental and flat decorative styles - may be cast and provided in lengths for use with other sign or decorative elements. 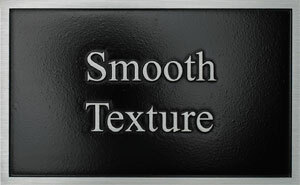 All plaques are manufactured with a background texture. When none is specified, leatherette will be used. 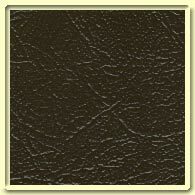 In addition to the background textures shown, custom textures can be provided at additional cost. Depending on the texture, we would require either the actual textured material in an appropriate size, or black & white artwork. 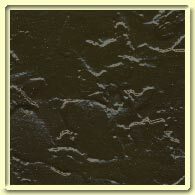 Currently, the largest material our background textures are available in is 30" x 40". 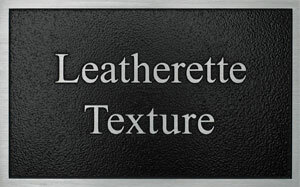 Consequently, all plaques exceeding this size will have a seam in the background texture. (The plaque itself is not seamed, only the texture.) These seams are disguised during the production process by our craftsmen, but may be visible on the final product. 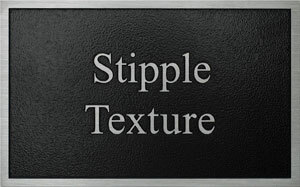 Because of the design regularity of pebbled texture, seams on plaques with pebbled texture cannot be hidden. 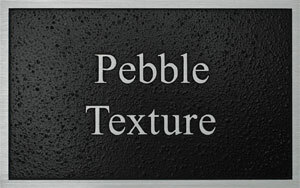 Therefore, we do not provide plaques larger than 30" x 40" with pebbled texture. stroke-sanded with baked enamel backrounds before being clear-coated and oven-baked with a two part hardened acrylic polyurethane. before being clear-coated and oven-baked with a two part hardened acrylic polyurethane. 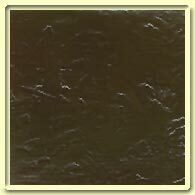 COMMERCIAL BRONZE (90/10) Alloy C22000; 90% Copper, 10% . Thicknesses include 1/16", 1/8", 3/16" & 1/4". NAVAL BRASS (60/39/1) Alloy C46400; 60% Copper, 39.25% , .75% Tin. Thicknesses include 1/16", 1/8", 3/16" & 1/4". include 1/16", 1/8", 3/16" & 1/4". STAINLESS STEEL Alloy 304; Optional Alloy 319. Thicknesses include 1/16", 1/8", 3/16" & 1/4". backgrounds before being clear-coated and oven-baked with a two part hardened acrylic polyurethane. when installed outside. Patina finish is available on smooth texture only. 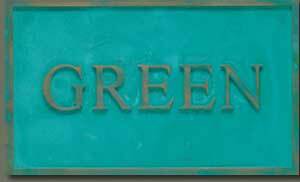 Between Bronze Memorials and the other bronze plaque companies and you will see a big difference right away! * Our customer base is over 40,000 after 37+ years in business. * Our goal is to help you design a beautiful plaque and to meet your deadline, at the very best lowest price, with the fastest deliver in the U.S.
* Bronze Memorials is the best company to make your plaque. It’s simple easy and fast. * FREE ground shipping on orders OVER $750 to all U.S. Addresses including Alaska and Hawaii and all military addresses around the world. 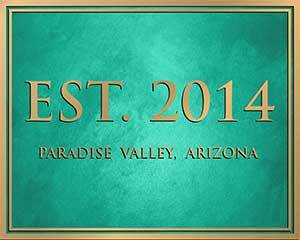 * Bronze Memorials is a 100% woman owned business enterprise. * Bronze Memorials will provide a full size bronze color presentation board matching your plaque design, and have the board delivered to you in 3 days, with overnight express shipping, to meet your deadlines. There are no hidden costs all plaques come with FREE shipping on orders OVER $750 , free artwork supplied for your approval, same day or next day after you place your order, before pouring your plaque! 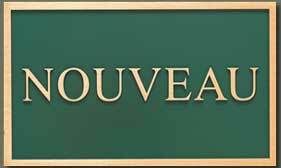 all plaques are complete including lettering and choice of border and includes all mounting hardware for installation. and no setup fees. Our price includes free ground shipping to all U.S. addresses and all military addresses. 3> then choose payment option and your plaque will ship in 15 business days. service is 6 or 10 business days. 4. Call us 772.924.0083 and we will fill out the form with you. Proud members of the International Cemetery, Cremation, and Funeral Association. Proud members of the Cremation Association of North America. over 40,000 plaques to our satisfied customers! Just ask our satisfied customers. 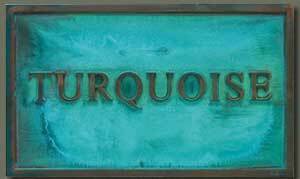 We sell Bronze Memorial Plaques and Custom Bronze Plaques and Memorials in Bronze, Cast Bronze Plaques in all 50 states, listed here and ship World Wide!